Young children probably don’t know much about how credit cards work. Therefore, in order to tell them about financial perspectives at the initial level, it is necessary to make them familiar of cash and then spending money on a regular basis through buying and purchasing of goods. In order to teach children about personal financial management, savings must be introduced as they play a vital role at the time of crises and crucial circumstances. For instance, parents can provide children with small piggy banks where they should be taught to put their savings. Find a penny in their pocket? It can go in the piggy bank. Eventually, as a parent, you can show them the value of savings. Once they reach a certain amount, allow them to see how beneficial that can be by allowing them to get something they need or want. Children can be encouraged to play games, such as monopoly, where they learn how to spend per their needs and requirements and also how to keep an optimal amount for future use. 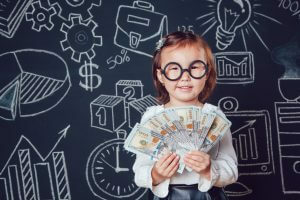 Children, since birth, tend to observe and highlight important events, therefore they must be taught how to utilize or reinvest their savings in order to obtain something more fruitful and profitable. Knowing and observing this helps the child throughout his or her life. It is vital that children know the value of hard work. They must be taught that money does not, unfortunately, fall from trees and that people strive hard in order to earn each single penny. Learning this early allows them to see the importance of money and the actual use of money. Children are keen observers. Therefore, parents must be conscious while spending money in front of their children as they grasp all key concepts that are regular activities. Parents can tell children to work hard to acquire a specific amount of money through providing them small tasks at home. For instance, parents can ask children to clean their room after playing for which they will be provided with 10 cents or any other particular amount; this would eventually allow them to see that working hard does have it’s rewards. Budgeting is an important act while dealing with a financial system in a household. Children can be taught the concept of personal financial management. Bookkeeping is a similar act to that of budgeting which refers to the record keeping of all transaction which have taken place in a household. Start simple so that they can learn early to track their expenses. A child, from the beginning, can learn how the ins and outs of financial management which will only provide for a smooth, prosperous and better future.